Beautifully renovated 3 BDRM, 2 BTH 1.5 sty home w/gorgeous open floor plan on just under 5 acre lot! Scenic exterior also provides covered porch, detached covered 3 car carport, detached heated 2 car garage, gravel circle drive, large deck overlooking HUGE level yard backing to trees and more acreage. Stunning interior provides new wood flooring throughout main living area, large open floor plan w/tons of natural light. 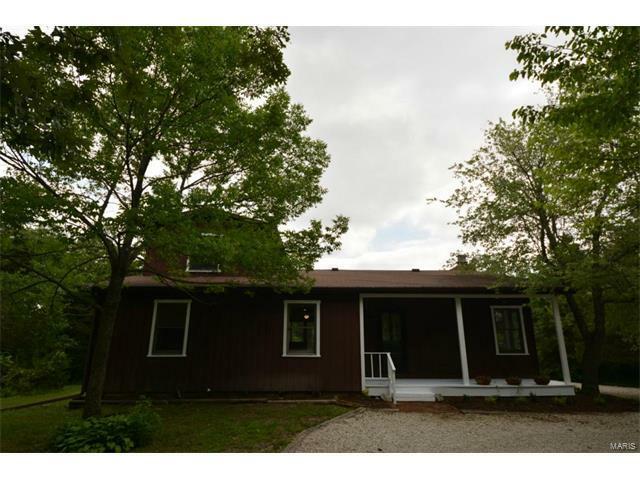 Spacious family rm also includes full masonry WB FP, wood ceiling paneling & floor to ceiling windows overlooking acreage. Breathtaking kitchen includes 2 pantries, new countertops, new backsplash, dbl electric ovens & electric cooktop. Also includes custom cabinetry w/new hardware. Main floor master includes LOADS of closet space and full bath w/tub and sep shower leading to main area. Upper level features add'l spacious 2 bdrms & full bath. All electric home is move in ready & includes new flooring & fresh paint throughout. Your new home w/acreage is waiting for YOU! 70W to exit 209 MO-Z, Church St. Turn left onto S Church St, continue on HWY Z. Take slight right onto Hwy N, turn left onto Morrison Ln, turn right onto Foristell Rd, turn left onto Oberhelman Rd. Destination is on your left.